Design and patterns in Lebanon. The organic market in Beirut. I am far away from Paris right now: I'm enjoying the summertime in Beirut. Stay tuned for photos and updates from this vivid, enticing city. Dazzling. But if I were in Paris this weekend, I'd find my share of vivid and enticing: I'd head straight to to La Rhumerie on Sunday evening for a fabulous free jazz concert by the New Caribbean Quartet. 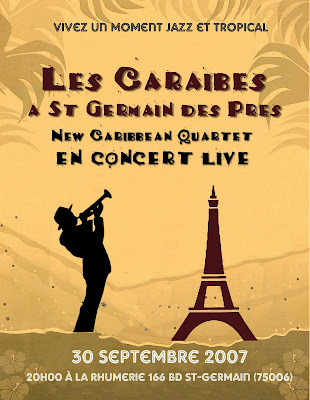 Formed just over a year ago and already taking the underground Paris jazz scene by storm, New Caribbean Quartet offers listeners a unique blend of contemporary jazz and the warm, joyful sounds of the Caribbean. The quartet’s original compositions incorporate traditional Caribbean music such as the beguine (akin to a slow rumba) and the mazurka (lively up-tempo dance) with the fresh sound of unmistakably modern jazz. You might not be able to tell the difference between these different styles of music, but the infectious groove of the rhythms will grab at your soul all the same. I guess I'm getting ornery in my old age. There I was, on the Place du Tertre in Montmartre on a balmy Paris evening. Finally overwhelmed with the myriad options inside the souvenir shop where my houseguests were selecting a few more dishtowels and calendars, and proud of my own excellent stocking-stuffer purchases, I stepped outside for some french air -- oops, I mean fresh air, of course. Anyway, I think it was the same guy from a decade ago, that singularly persistent one, who approached for the kill. Caught between Scylla and Charybdis, I was. Inside: more souvenirs and fluorescent lighting. Outside: hungry portraitists. Cranky and resolute, I steeled myself and steered a steady course. Artiste (whipping out his sketch pad and beginning to sketch): "Portrait?" Artiste: "You don't have to buy -- just let me sketch you." Ornery (this time in relatively rapid-fire French): "I don't need you to sketch my portrait. I live here in Paris. Besides, I have a friend who lives in Montmartre who is an artist." Artiste: "Non, non, I'm just sketching you because I'd like to. Of course there are many artists in Montmartre." Ornery: "Sketch away, monsieur, comme vous voulez -- but I couldn't pay you anyway. I have about 60 centimes in especes on me." Artiste (still sketching and trying the let's-get-chummy ploy): "So, what is your name?" Artiste: "Oh, come on, now. No reason for animosity. Tell me, what is your name?" Artiste: "Well, if you're going to be like that, I'll stop sketching you." Already blessed with many dimensions, French men are gaining in height and shape, too, according to a recent study. In the past 30 years, the average height of a French man has increased 2.2 inches, and he's gained 11.8 pounds. The study, conducted by the Institut francais du textile et de l'habillement, places French men's height in 4 categories. As an expat it's fun to have house guests in Paris. Well, sometimes not. But when it's pals who have known you since high school but who don't know Paris very well, they always get you to see an angle of this city that you might normally pass by. For example, I usually avoid the "tourist traps" like the plague. How myopic and foolish of me! These spots are actually a cultural experience quite worth the look-see. This week, with my dear chums Rita and Cynthia visiting, I've had the chance to visit innumerable tourist shops and fly-by-night stalls that hawk all the Tee-shirts, shawls, goo-gaws, Eiffel Tower miniatures and Paris snow-globes that are bought on the last-minute frenzy of "what can I take home for the kids?" This time, I embraced it all, and discovered a new side of Paris design and commerce that I had neglected for so many months in my self-imposed "I'm-not-a-tourist-I-live-here" ethic. Oh, we visited all the Important Cultural Sights, of course, but there was always the need to find that perfect souvenir. You know what I realized? For as long as I like visiting the sights of Paris, I too am a tourist. Yippee. Paris métro station interiors. Some are mundane, while-tile-and-billboard affairs. Some I find downright annoying, like the neon chaser-lighting at Maubert-Mutalité. (Will someone please turn that thing off?) Some are in the throes of sorely-needed faceifts. 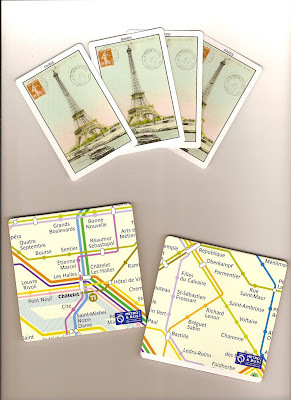 But there are a number of stations that have enough artistic interest that it's fun to go out of your way to head underground to take a peek; in any case, they make the journey more culturally stimulating -- if the adrenaline of the métro traveling isn't enough. 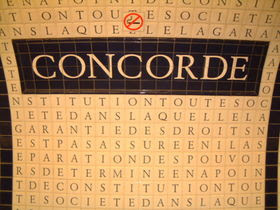 On my more familiar routes, I love the scrabble effect of the lettered tiles of the Concorde metro station. The mosaics spell out the text of the La Declaration des Droits de l'Homme et du Citoyen. At the Varenne stop, a large copy of a Rodin sculpture. And I've learned some intriguing scientific facts at Champs-Elysées-Clemenceau while waiting for ligne 1. The Louvre-Rivoli stop, with its lushly lit display cases featuring copies from the Louvre, makes me feel as though I should talk in hushed tones of a museum, even when the train is squealing to the platform. In my moonlit musings about métro station decor, I wonder if the RATP would be adventurous enough to have a sculpture of Cerberus guarding some métro entrance, but I guess the analogy might scare away more erudite passengers. Lacking Cerberus, there is still ample reason to head underground, at the art gallery at the Premiere station -- which, as you may have guessed, was the first métro station in Paris, at Palais Royal-Musée du Louvre. The gallery currently features an exhibit called Strip-Off. Not removal of clothes, but wallpaper. It's a collection of wallpaper that has been used in surprising ways by artists from the IESA, the Institut des études supérieures d'art. Added are complementing original costumes designed by couturiers such as Jean-Charles de Castelbajac, Elie Saab, Jacques Garcia, and Franck Sorbier. On September 27 at 6 pm, as the finale to the exhibit the wallpaper will be stripped off, signed by the artists, and auctioned off, with the proceeds going to charity. It's almost autumn in Paris. The morning air has a chill which slowly abates as the sun takes hold of the day. Last year, my first Fall in Paris, I had a pang of homesickness. I realized that I missed New England's autumn leaves. Not the brilliant blaze of color from sugar maples and birches, though that was a perennial favorite. No, I missed the smell of rotting leaves. That delicious pungent fragrance -- which used to be found all too often in unraked piles in my yard. But also the comforting earthy aroma of walks in the woods in Massachusetts. Paris is a verdant city, with some of the most gorgeous parks, but all so carefully groomed, so well-maintained. No decomposing leaves from the thousands of horse-chestnut or plane trees. "Try the Parc de Saint Cloud!" suggested my friend Daphne, who politely declined my request to bring me a ziploc bag of old leaves when she returned to Paris from a trip to New York. So I went to the Parc de Saint Cloud last autumn. Majestic, fabulous place, easily reached by metro and a hop across the bridge. I could walk there for hours. Then one morning as I took a short cut by the Trocadero, I happened upon a path in a small grotto leading up to the Musee de la Marine. There it was. I sat down on a stone bench and inhaled deeply. Dead leaves. Ah, Paris felt like home, at last. Today was Day 2 of the Journées du Patrimoine. I got up early so I could slip in to the Hôtel de Matignon, the Prime Minister's residence, two blocks away, before the crowds arrived. Who was I fooling? Others clearly had the same thought. I don't do lines. So instead I went to the Hôtel de Rochechouart, which houses the Ministère de l'Education. No lines! The security guards waved me through after a quick check, and there was just a handful of visitors. I don't mean to sound blasé, but once you've seen a few ornate gilt moldings in government buildings, a few magnificent escaliers d'honneur, they all start to seem almost run-of-the mill. And it's safe to say that some are better maintained than others. The main attraction at the Hôtel de Rochechouart, curiously, was this stairwell wall with portraits of all the French Ministers of Education since 1828. People who breezed through the rest of the building stopped in their tracks and examined all the names and faces in the gallery. It's interesting not only from an historical point of view, but also to see how hairstyles and beards, and general demeanor of public officials, have changed over the years. Next stop was the Hôtel de Montmorin, which houses the Ministère de l'Outre-Mer. I didn't have much time to linger, but it was impressive. Mostly I was drawn to the garden. When the sky is cerulean blue like today but I have to stay inside and work all afternoon, I plunk my chair in the end of my petite kitchen. With the windows wide open, I can get my daily dose of sunshine. My own indoor outdoor cafe. Didn't get a tan this summer, so why not now? Luggage and Wallets and Bags, Oh My! September is busy houseguest season here in Paris. It's such fun to have all manner of friends and family from the US collapsing on the sleep sofas in the living room. Of course, getting actual work accomplished is another story. But life is short, and sharing Paris with people you love is part of the joy of living here. When parading my jet-lagged pals around la Capitale, I never miss the opportunity to take them to La Maroquinerie Parisienne. Especially because it's conveniently located on the sightseeing/shopping trajectory from place de la Concorde to place de la Madeleine to Galleries Lafayette. The shop, on the 2nd and 3rd floors at 30 rue Tronchet, is chockablock full of Longchamp, Lancel and lots of other name-brand leather goods, all at a 10 - 20 percent discount, sometimes marked down even more. Rarely does anyone leave empty-handed or less than thrilled. "Maroquinerie" means leather goods store. 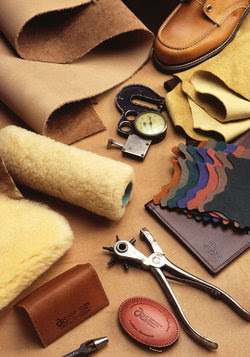 The short version of the word's etymology: originally most of the finest finished leather (maroquins) were from Morocco, which is "Maroc" in French. Faster than you can say "mah-rock-een-ree" you'll be in discount handbag heaven. A US friend just emailed me a news article about a new French company that for a fee, will create an alibi for a spouse who is involved in an extramarital fling. Phone calls, fake receipts, and the like. All the usual cover-ups. Ibila (Alibi in reverse) offers it all. "Leave it to the French!" crowed my pal, the implication being that the French are the most in need of such a service. Clearly he hasn't read Lust in Translation, Paris author Pamela Druckerman's fabulous and, fundamentally, witty book which investigates infidelity around the world. Druckerman, a former Wall Street Journal reporter, did her research. According to her findings, French and American rates of marital straying are about equal. Americans just worry about it more. So, perhaps what my friend meant was "Leave it to the French" to be ingenious enough to make a euro from a service for an existing market. Maybe Ibila should open a US branch. 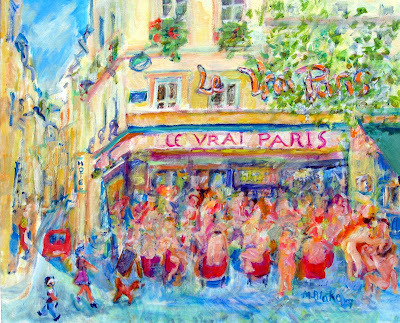 "Le Vrai Paris, à Poil" is popular Montmartre artist Mary Blake's latest oeuvre. To give the painting an ironic twist, she removed the clothing of the revelers. "It didn't start out that way," says Mary, who is a well-known figure in the neighborhood, and in all of Paris. You can spot her most days at her easel painting scenes at any of the famous cafés and parks of her beloved quartier. Her subjects, however, are normally clothed. "But the clients were all so blasé, so I decided to undress them. They didn't notice, but the passersby sure did." Chapter One. In the 1970s my family lived on Mount Desert, a majestic island on the coast of Maine best known for Bar Harbor and Acadia National Park, and its French discoverer, Samuel de Champlain. There were a number of luminaries living on the island at the time (many more so today) but mostly all of them were Summer People. Not Madame Yourcenar. Marguerite Yourcenar, by then, had achieved great international stature as a Woman of Letters. Despite her relative fame, she lived a quiet, simple life at "Petite Plaisance," a small white clapboard house in Northeast Harbor, where she wrote many of her great works. As a recent French Literature grad, I had heard of Madame Yourcenar, but was unfamiliar with her works, as her classics such as Memoirs of Hadrian were not in the canon of required study at the time. She lived on the island year-round, and also traveled a great deal with her lifelong companion, Grace Frick. This is where I came in. My mother owned the only travel agency on the island. Always proud of her French-speaking daughter, Mom encouraged me to practice my French whenever possible, often to my embarrassment. One chilly March afternoon when I was Down East for a visit, my wily mother handed me Madame's just-booked plane tickets and nudged me out the office door, saying, "Go deliver these to Madame Yourcenar. She's expecting you." I drove around the empty village streets for a while, delaying my arrival as I rehearsed potential conversation. What do you say -- in French -- to a great author whose books you've never read? I strode up the stone path, shouldering the brisk breeze and clutching the ticket envelope. In the grey afternoon, the lamplight from the front hallway projected in shiny yellow squares through the windowpanes. Gathering my courage, I rang the doorbell of the cottage, nervous and cotton-mouthed. Madame Yourcenar opened the door. If ever there was kindness and wisdom personified, it was she. Her calm, enveloping warmth made me feel instantly at ease. I remained mostly awe-struck and tongue-tied, but she had a natural comfortableness with words that helped to fill in the empty spaces. I stammered a bit and gave her her tickets. She asked about my studies, and offered me Memoires d'Hadrien and Archives du Nord in paperback, autographed. "A Polly. Bonne Lecture. ROMA/AMOR Marguerite Yourcenar"
Our conversation lasted about 5 minutes. I felt as reverent as if I'd visited the Pope. 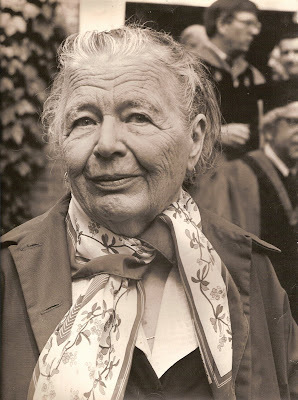 A year or two later, in 1980, Marguerite Yourcenar was elected to the Académie française, the first woman in its history to join Les Immortels. Next chapter. The following year, she received an honorary degree from Harvard University. Although I lived in Boston then, I wasn't at the commencement ceremonies. Harvard never releases the names of honorary degree recipients prior to awarding them; but a French photographer friend, Philippe Gontier, heard the rumor that she might be an honoree, and recorded the event. Philippe's masterful portrait above, of Yourcenar at Harvard 1981 graduation, captures her warmth and wisdom... and the perfect silk scarf, magically in place. This is one of the few photographs I've seen that expresses the same radiant essence of Marguerite Yourcenar that I experienced. Philippe, knowing my anecdote of meeting Madame Yourcenar, gave me this photograph the following week. Later, he left Boston, and I've since lost contact with him. I think he may be in Paris, if it's the same Philippe Gontier. I've never seen this cherished photo published elsewhere. Maybe he has others. Marguerite Yourcenar died on Mount Desert Island in 1987. Her house, Petite Plaisance, is now a museum. Another great blog I just discovered, via BuzzFeed. This one is PaleoFuture. 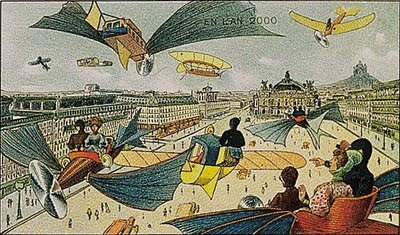 France in the Year 2000 -- as imagined in 1910. Cool. Check out all the prints on their site. 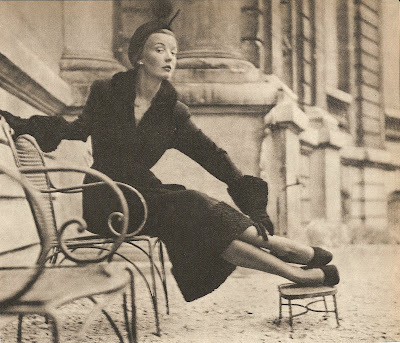 I used to think that life would be perfect if we could only return to the days of glamour and elegance as in this Parisian photo. I still do, in some ways... Just don't take away my cell phone, WiFi or Velib, s'il vous plait. Besides, lest we forget, when the glam shot was taken of this model, she and other françaises had only gotten the right to vote 5 years before. I sure hope that's not a suppositoire that maman is wielding. by WGBH, Yale and Wellesley College with funding from Annenberg/CPB. The world has never been the same for those of us who fell under its spell." So begins the wonderful new blog, Mystère et boules de gomme!dedicated to this immortal TV series, which was used in classrooms and by francophiles across the US. Such a classic. Alumni and fans are encouraged to contribute to the blog and its wiki. I'm sorry. I humbly repent and will never, ever, ever pun again. Honestly -- it's not my fault. This pun just jumped out at me at the Marché aux puces at Vanves yesterday. 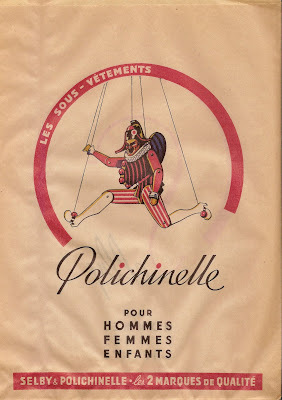 There I was, innocently looking for bargains amid the antiques and suddenly, there was this Polichinelle paper bag. What could I do but fork over one measly euro and snicker at the terrible pun I was about to commit? It was beyond my control. There, now, I've assassinated that miserable joke, if it was ever alive in the first place. March on to the marché. The Marché at Vanves is an eclectic place, in terms of wares, prices, and attitudes. I'd been there three or four times before, and always found a good bargain and friendly merchants. This time, I saw even more merchandise than before, perhaps because it was earlier in the morning. Everything from huge 18th-century gilt frames to cheap housewares. First I spotted a pair of rusted triangular metal garden sidetables that would fit perfectly in an odd space in my apartment. The marchand, who wanted to sell all four (I guess it was a set) was not exactly chummy. His terse "600 euro for the four, or rien du tout," didn't quite encourage me to hang out much longer, perusing the goods. Whoa, not my price range for used tinsel, no matter what the provenance. I thanked him perfunctorily and moved on. Next I saw a woman displaying a tangled mound of gorgeous silk threads with the most delicious jewel-toned hues. I asked her politely if she would allow me to take a photo of the pretty pile. 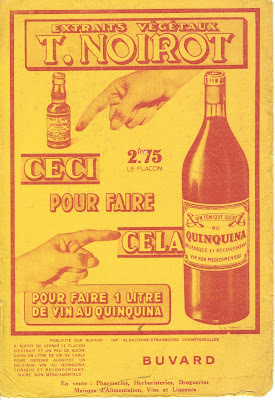 "Ah, ça, non!" she barked. I retreated, and replied, "Oh, d'accord, okay, I understand. It is just that.. it was for an article I'm writing on the Marché aux Puces." "Alors ça, surtout pas!" she grouched. Wow. No photo just of a bunch of thread? I slinked away, totally intimidated, and stashed my camera for the next 15 booths. Then I came upon this collection of hat pins. Hesitatingly, I ventured to ask the owner if I might have permission to take a photo. 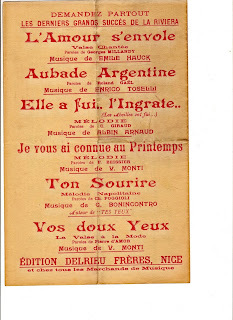 "Mais bien sur!" she smiled. "Most people don't even ask; they just snap away. How kind of you to ask me." Then at the next booth, the owner was positively jolly. He was chatty and helpful; and when it took him a while to get change for my minuscule purchase, he joked to his colleague, "It's just my way of trying to draguer la cliente [pick up the customer]." We all were instantly kidding on the same wavelength, and reveled in the the banter before parting company. I was clearly on a roll. Maybe my earlier encounters with Monsieur and Madame Grumpy were aberrations; maybe those two just hadn't had enough coffee yet to perk up. Time to forget about them and move down the line. Meandering throughout the crowds, I soaked it all up. A fraternity of regulars sat under an awning in the back of their combined booths, playing poker, smoking and joking. 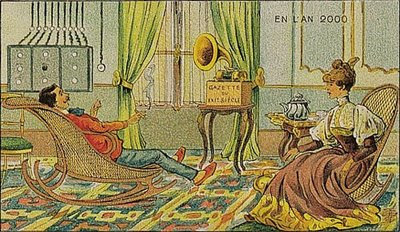 A well-dressed Frenchman (jeans and gingham shirt, polished loafers) on his cell phone describing the legs of a mahogany table. An American couple bickering over the pros and cons of a marble fireplace mantel. At my final booth, I once again asked for the green light to photograph, and this woman actually said, "Avec plaisir!" So kind and caring. I felt renewed. Her friendliness and good humor drew a healthy crowd of customers. I adored the pitcher and cups. "Nous Deux" on the pot. "Toi" and "Moi" on the cups. Kitschy and sweet. I have chronic trouble remembering the genders of certain French words. I've mumbled "luh" in front of the French word for umbrella all my life, not sure if it's le or la. 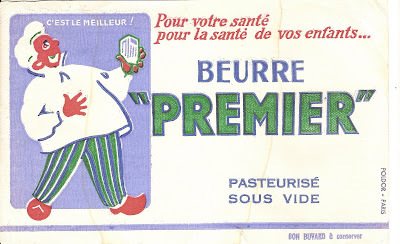 Finally, an elegant way to remember that it's le parapluie but la pluie. Watch out. 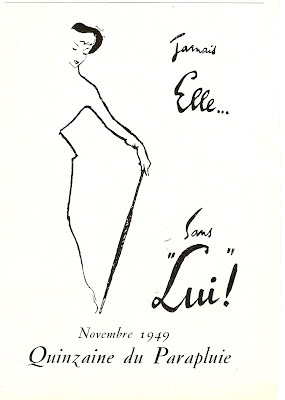 I'm immersed in a stash of French fashion magazines from the 1930s - 1950s. Heaven. Je craque! 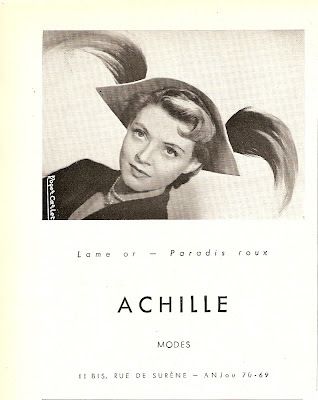 This milliner's advertisement from 1949 caught my eye. 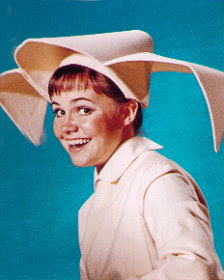 It must have been inspiration in 1967 for Sally Field's wimple in The Flying Nun. 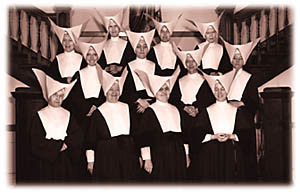 Other sources claim her cornette was inspired by that of the Filles de la Charité, but I have my doubts...theirs is much more restrained and classical. You know what it's like when you stroll down the streets of Paris. You see huge, fancy doors, an imposing edifice, a hint of a grand courtyard... and you wonder what's inside. Could it look like this? On September 15 - 16 it is your once-a-year chance to get a sneak peek at the glories or mysteries inside many historic buildings that are normally closed to the public. The 24th Annual Journées du Patrimoine (Heritage Days) will take place in Paris and across all of France and Europe next weekend. Actually, this event isn't limited to continental Europe. Guadeloupe and many other French DOM-TOM are hosting Patrimoine open houses as well. If you are in Paris, there are virtually endless visiting spots for the incurably curious. This year, you can even visit President Nicolas Sarkozy's office and the grounds of the Elysée Palace. Dozens of sumptuous, jaw-dropping hôtels particuliers and other architectural gems in every arrondissement. Expect lines at the more popular spots. Those who prefer a day trip from Paris could visit a chateau in one of the nearby departments, such as Yvelines, where the black-and-white photo above was taken some 60 years ago. Incroyable, non? 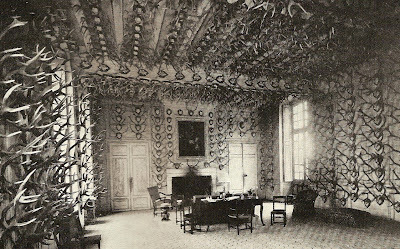 I dream of some day getting a glimpse inside this particular chateau, which in its time boasted the largest collection of antler trophies in France. Alas, it's not open to the public. From what I've been told, only historic buildings that have received renovation funding from the government are required to open their doors. Nevertheless, the options are enthralling. Anyway, having been drooling for months over the photos in Olivier Blanc and Joachim Bonnemaison's coffee table book, Hôtels particuliers de Paris, I've decided that I'm sticking to the 7th arrondissement this year. So many neighbors, so little time. While the fashionistas of Paris ramp up for fall Fashion Week, the rest of us ladies have one burning question: how to sport around town by bike and still look chic? Now that the Vélib bike rental program is such a smashing success, Vélib fashion is next to follow... we hope. There's a little issue of rain in Paris. Intermittent rain, of course, so you never quite know when you'll need protective outerwear. That collapsible umbrella I always carry just doesn't do it while steering my bike through Paris traffic. In the Madame Figaro edition of August 24 I spotted a hint that more vélo-appropriate attire may soon become trendy . The guide featured an elegant poncho, kidskin driving gloves, and sporty little boots, touted as perfect for Vélib outings. Whether it's by vélo or Velib, having something practical but non-embarrassing to wear while braving the elements would be a welcome relief. I keep returning to the images of Laetita Casta in "Le Grand Appartement". In the movie she pedals furiously around the 7e arrondissement in a disposable plastic poncho (which looked like an expanded version of a rain bonnet). Of course, she'd look gorgeous in anything. The rest of us...naah. So let's hope our Vélib attire for the Fall/Winter 2007-2008 fashion season doesn't all have to come from Decathlon. 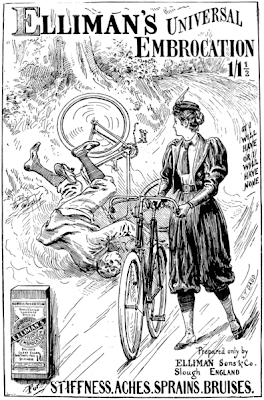 Fashion designers: on your mark, get set, pedal! Bustling lunchtime. I'm having a noix d'entrecôte at Café Le Babylone, next to Le Bon Marché. I ask the young guy at the next table if he could pass me la moutarde, s'il vous plaît. Under a curly mop of hair, his glance softens, and with a genuine but soulful gaze as he locks onto my eyes, he replies in a deep trill, "Ah, I knew this would be my lucky day." Then bien sûr, his hand lingers on mine just that extra brief second as he hands me the pot de moutarde. His engaging smile polishes our little duet. How can this be so enticing? Oh, but it is. And we're just talking about a flippin' mustard jar! I hate to say it, but if Joe American had tried to pull off a line like that, it would have been icky. Laughable. This Adonis is a Grand Flirt Master. 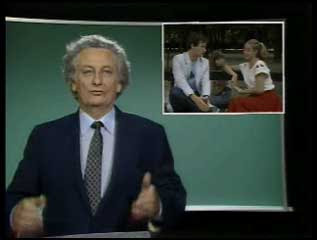 I'd have fallen in his lap on the spot if he hadn't been about half my age. "Merci," I whisper demurely. What happened to my voice? Michel (who is my age) remarks, eyeing me as he smokes a Marlboro Light, "You must have been very thin when you were young." "Merci ...a pantload," I grumble inwardly. Two birds. One stone. 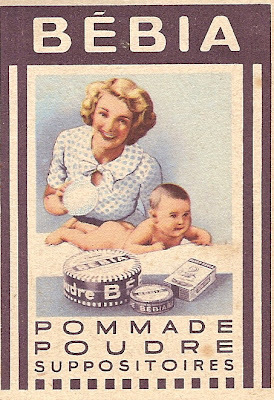 I've always loved antique labels and advertising. At French brocantes I discovered these buvards. And at a euro or two apiece from a brocante, they could make an inexpensive design statement when framed; perhaps on my kitchen wall? I bought a half-dozen of these last November and haven't framed them yet. I like the texture of the thick paper. OK, I'm lying. I haven't gotten around to framing them yet. 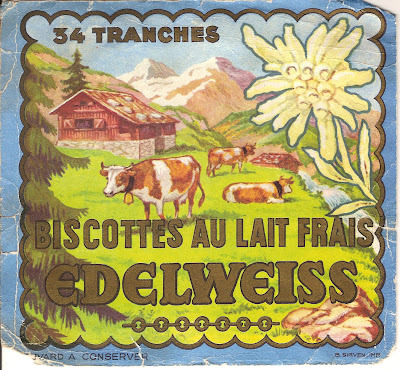 Inspiration comes from reading Tongue in Cheek's stories of antiques-hunting in France.